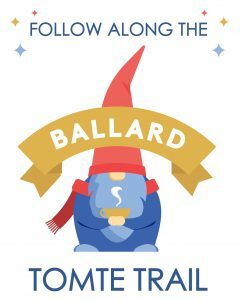 Enjoy live music, complimentary photos with Santa, popcorn, treats, hot chocolate and cider and find out the winners of the Tomte Trail adventure at this free event celebrating Holidays in Ballard. On DECEMBER 1st from 3 p.m. until 6 p.m., bring the whole family for some festive fun in the heart of Ballard at Bergen Place Park! Follow us along the trail of the Jul-Tomte as he searches Ballard for his beloved bowl of buttered rice pudding. Be sure to look high and low inside the shops of Ballard during the month of November to find the tiny Tomte. Receive a stamp or signature from each shop where you find the Jul-Tomte. A Family Plus Nordic Museum Membership with reciprocal benefits at over 850 museums in North America! Special thanks in advance to Swansons Nursery for helping us create a Nordic wonderland in Bergen Place Park at the Ballard HolidayFest 2018.